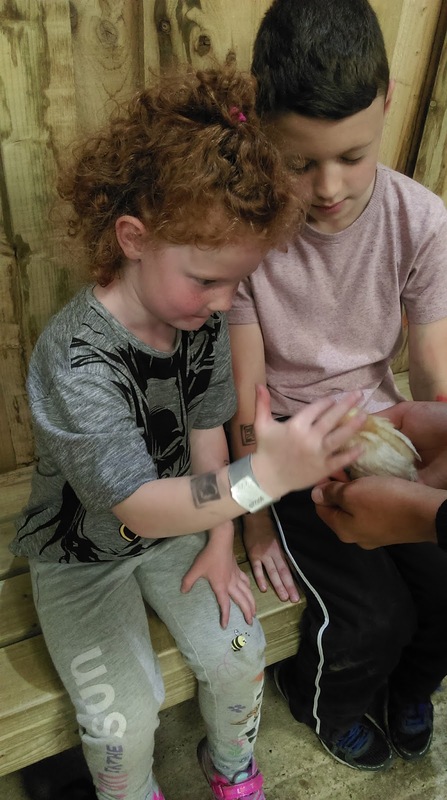 If you find yourself looking for a fun filled day out with the children, you could do with visiting Bocketts Farm. It's 5 minutes drive from Junction 9 of the M25 and is set in the beautiful Surrey countryside near Leatherhead. It's open almost all year, closing only on Christmas and Boxing Day and 1st January. Armed with a picnic the tiddlers and I set out for the day. Luckily we don't live too far away so it was no more than half an hour drive for us. There is ample free parking although the later you arrive you may have a bit of a walk to the farm entrance. Adult entrance is £9.30 and children aged 3-17 are £9.95 each. Under 2's are free and oddly 2 year olds cost £8.20. At the entrance you can buy bags of animal feed for 90pence. As soon as you enter, you are greeted with what looks like mayhem. There are trampolines, small trucks and ride-ons, a soft play, a place to get tea, coffee and snacks and the loos. There are picnic tables and benches. You are hit with noise. My two ran off to the ride-ons whilst I gathered myself and started looking at the map and planning what we wanted to do. 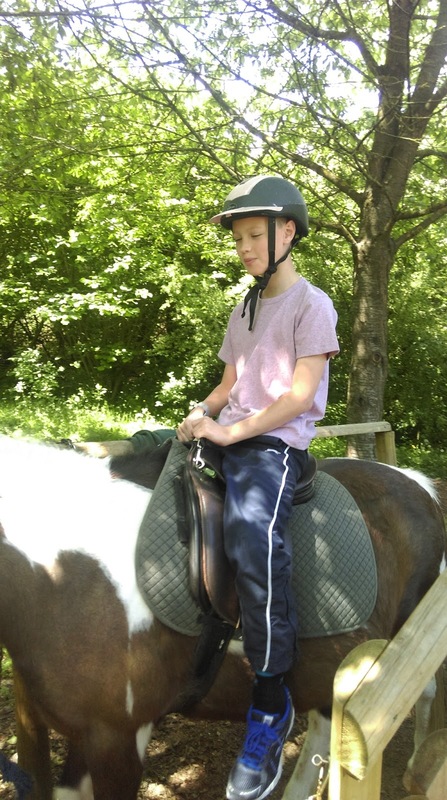 Pony riding was something they like to do. 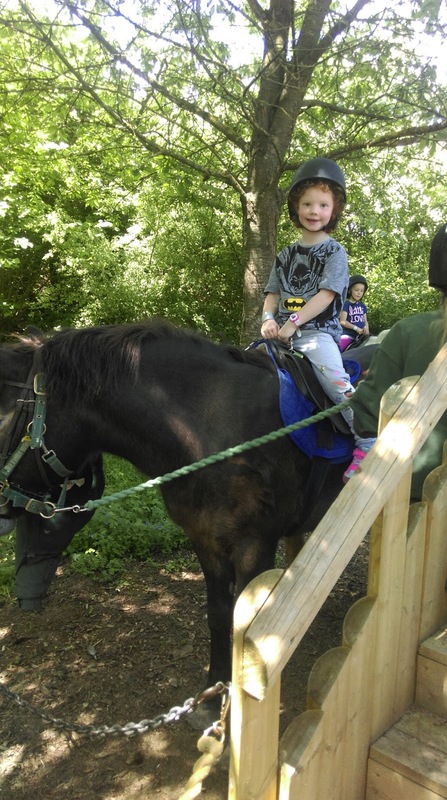 Bocketts run the pony rides twice a day during weekends and school holidays, this comes at an extra cost of £2 per child and is extremely popular. 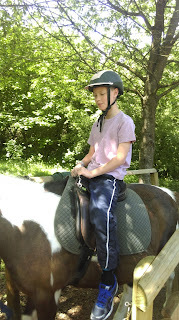 By the time I'd prized them off the ride-ons it was almost time to go and queue for the ponies. Both children were fitted with helmets and had their ride. It's quite a short trip as they are trying to fit in as many children within the hour time-slot as they can. 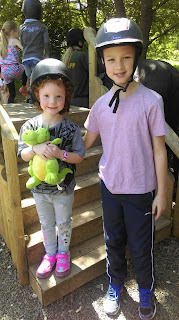 After the horses we stopped at the go-karts next door. There are two tracks, under 5's and over 5's. My 5 year old was very happy to be able to go onto the "big" track. They raced around, competing with each other as usual. As if cycling the go-karts wasn't tiring enough, they went straight onto the huge bouncy pillows. Again there's two, over and under 5's. By now they had worked up and appetite so we set up our blanket in the picnic area. The kids would have a munch then wander off to the playground then come back for more. It was lovely for me to just sit and relax. When we left the picnic area, we went up to the Big Animal Barn where they have, pigs, goats, sheep, cows, donkeys and llamas. Being spring time there were lots of lambs, kids and two calf's (one only 3 days old). I was sure the 5 year old would happily have sneaked a lamb home in her rucksack! We fed the animals then after thoroughly washing our hands we wandered past the stable area inside to the soft play. I went and got myself a lovely cup of tea and found a table to sit and watch whilst they exhausted themselves running around and going down the large four lane slide. When they had finally had enough, I treated them both to an ice-cream. As they needed to cool down and I felt they could do with a rest, we walked up to behind the Big Animal barn and waited for the tractor and trailer ride. This costs £1.25 each extra. We waited for about 10 minutes under the shelter. The tractor ride took approximately 15minutes and went around the perimeter of the farm. It is a working sheep farm and they had about 1,000 sheep with the new lambs. The children decided they wanted to go on the go-karts again, then the big pillows. By now it was almost 3pm so we went to Little Hoppington where the small animals are kept to watch the goat milking. Straight after this is the small animal handling. Again I think the 5 year old wanted to smuggle everything out. 3.45pm and it was time for the pig racing! There are five piggies given fun names: Peppa Pig (obviously), Bradley Piggins, Boaris Johnson, Harry Trotter and Kevin Bacon. They run on a very short course but the staff do a good job at getting everyone eager and ready to shout for their favourites! 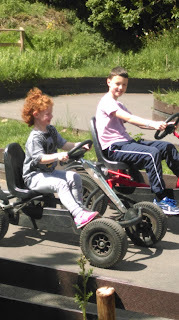 By now it was 4pm, the kids decided they wanted "another" go on the go-karts. I needed another cup of tea by now so after the go karts I got my tea then we all went to the outdoor playground. I gave them 45 minutes then we went inside. They hadn't been on the trampolines so of course had to do this too. I have no idea where they got so much energy for all this jumping, leaping and playing! To leave you have exit via the shop. Ah that old trick... I had already pointed out to mine that I was NOT going to buy anything and we left, exhausted, dirty, sweaty and happy.